This cozy rural villa for twelve provides authentic experience of the Mediterranean village as it once was. Restored using authentic materials, it has a traditional feel of belonging to a place. During 2012 restoration we tried to keep villa's authentic shape with careful attention to details. The villa offers all comfort one might look for in a contemporary home in harmony with tradition and nature. Behind the villa there is a private parking place,garden with Mediterranean herbs and flowers and children playground (320 sqm). The villa has kitchen, living room, small and cute reading-room, 5 bedrooms, 4 bathrooms+1 toilet. Kitchen, living room, toilet, reading-room and master bedroom (double bed) with a bathroom are on the ground floor. Four bedrooms (three with double beds and one with single beds) and three bathrooms are on the first floor. There are no inner stairs, but two pairs of beautiful outer original stone stairs. The front yard of the villa has a pool (3x6), barbecue, porch with massive oak dining table and old kitchen cabinet. There is also one more porch perfect for morning coffee or afternoon tea and one balcony, all with a pool view. We are a young married couple. I'm the university teacher and Marko, my husband is engineer. We are in tourist business for seven years. This is our second holiday house. We provide our tourists warm welcome, information and everything they need to have the best possible holiday. You are welcome to contact us with all your requirements ... Welcome:-))!! We absolutely adore Vinodol valley. The nature is so beautiful and the villages are picturesque and quiet and, still, it takes you only ten minutes to the city and the sea. I love this house because it has so many beautiful details and provides authentic experience of the Mediterranean village as it once was. Some rooms have traditional rural bathrooms integrated in the room (shower and wash-basin are in the room - but there is a wall and curtain to secure your privacy while you are taking a shower). In these rooms, toilet bowl is in separated area. There is also one more outdoor shower near the pool. We have just come back from a really enjoyable week at Villa Aurora. It is a really charming and comfortable house in a lovely part of Croatia. 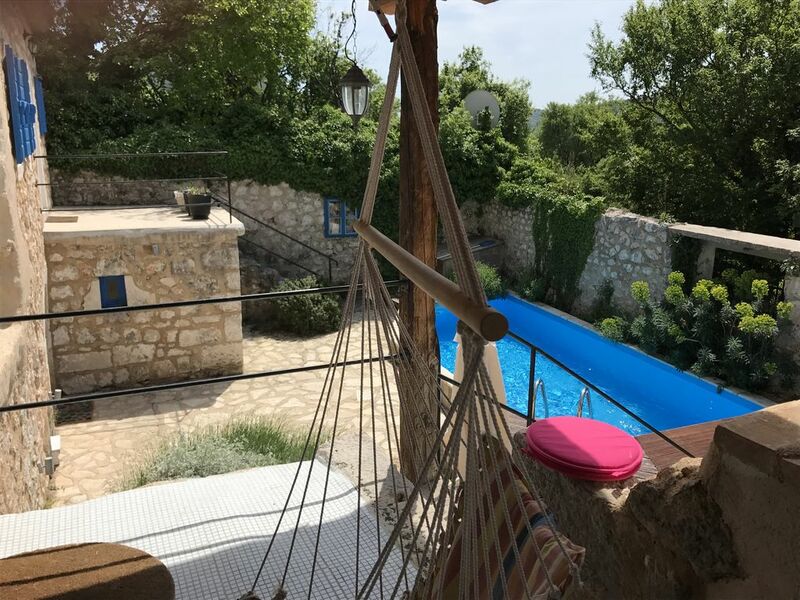 The owners, Borana and Marko, have done a great job of renovating the place so that it still feels like an old stone house, but it has all the modern fittings you need and loads of stylish touches that make it a real pleasure to stay in. The kitchen/diner is very well equipped, but we cooked on the huge built-in barbecue and ate in the outside dining area every night. It would be a great house for two or even three families with children to stay in together, as four of the bedrooms are arranged in pairs where parents could be close to children, and the pool is right outside the kitchen/sitting area. We actually went as three couples, which meant that everyone got their own private space away from the others. The beach and the nearest town are about ten minutes drive away. The area around the villa is also quite scenic - so long as you have a bit of a head for heights, you have to do the stone steps walk around Grižane-Belgrad - hard work but really interesting and great views over the area and to the coast. We even managed a day out to the fantastic Plitvice Lakes National Park - quite a long drive but well worth it. Borana and Marko were really friendly and helpful too. Although nothing went wrong in the house, I’m sure they would have been straight round to sort it out as they live a few minutes away in the next village. Highly recommended - for big or small groups. Nous avons passé un magnifique séjour en Croatie à la Villa Aurora de Borana et Marko. La maison est située dans les hauteurs, à proximité de la mer. L'environnement est propice au calme et à la détente, un vrai havre de paix. Nous étions 3 couples avec 5 enfants dont un bébé. Chaque couple disposait de sa chambre, de sa douche et de toilettes. La maison est superbe, belle rénovation, décorée avec goût et la piscine est le petit + !!! Les propriétaires Borana et Marko sont deux personnes très généreuses, charmantes et très disponibles. Une de mes filles a été malade pendant le séjour et c'était très rassurant de compter sur Borana et Marko pour nous aider à trouver un médecin, Marko nous a même accompagné ! Au nom de l'ensemble de notre groupe d'amis, je vous recommande vivement cette location pour votre prochain séjour en Croatie. Aucune déception, tout était plus que parfait !!!!!!!! Das Ferienhaus war ein Traum! Wir haben im Juli 2 Wochen im Ferienhaus Aurora verbracht und uns sofort sehr wohl gefüllt. Das Haus Aurora ist komfortabel und geschmackvoll eingerichtet. Es ist ein wunderbarer Ort um sich zu erholen, einfach zu entspannen. Die Vermieter sind supernett und sehr hilfsbereit, die stets mit Rat und Tat zur Seite standen. Ihre Tipps waren einfach super. We stayed for a week at this wonderful holiday villa. We could not have wished for a better holiday. Upon arrival, the owners Borana and Marko meet us, showed us around and were most helpful! They were so lovely, we've never felt so welcome on a holiday! We were provided with home made cheese, olive oil, a basket of fruits and homemade liker. The villa is situated in an nice location, very close to Crikvenica and Vinodolski. It is well maintained, well equipped and clean. The pool was perfect, a lovely temperature and cleaned regularly. Eating outside in the evening with the pool lit-up and candles everywhere was amazing! All in all I can recommend this place without any reservations to anyone. If you are looking for place where you can spend quality time with your family / friends, this is the place. We've had an outstanding stay at Podgori 60!! From July 12 till July 27 2013 we had an outstanding holiday in Podgori 60, at Bribir (Crikvenica). The swimming pool was a great hit, as wel as for the kids as the adults. Our family --father, mother, 3 daughters and their husbands, a 3-year old granddaughter and a baby-- gathered together in this awesome place. With 5 bedrooms every couple had his own 'property'. The house was clean and well-maintained. After one week all the bedding and linen towels were replaced. Also the hospitality delivered by Borana and Marko Mohorovicic was outstanding, including their tips for having diner outside. (We special recommend their tip about restaurant Vagabund, that we have visited twice! Also the food of the pizzaria at the local square in Bribir tasted excellent!) Visiting the Adriatic-beaches is only a 10-minutes drive. Being hosted this summer by Borana and Marko was our first meeting... it will not be our last...! This is the 2nd year running we have rented a villa from Borana and Marko. The previous year we have been at Casa Colori. Based on the photographs, we were pretty happy about making arrangements to stay in this villa. But when we actually arrived, we saw that everything about the place far exceeded our expectations. It was the perfect retreat from all the stress of everyday living and working. On our arrival we found waiting for us cheese, olive oil, fruit and drinks. The young owners, Borana and Marko are very charming, kind and welcoming. They looked after us so well; we were even taken to the supermarket on the first day to stock up. They really made us feel at home away from the start. They gave us plenty of useful recommendations regarding dining, wine tasting and other activities. The beach, wine roads and even local festivals are all in the proximity of villa Aurora, which made our stay here even more enjoyable. On the porch we spend the most evenings, drinking a local wine and enjoying a delicious barbeque. The villa is situated near Bribir in Vinodol valley. Vinodol valley is famous for its natural beauty. You can enjoy a breathtaking view on the hills behind the villa and still - it takes you only ten minutes to the sea. In the hills (about 20 minutes by car) there is a famous rural restaurant with natural and traditional food and the road that takes you to the restaurant has a breathtaking view on the Kvarner bay (including the islands). In our villa you can enjoy your holiday in full privacy and beautiful nature. You can taste traditional domestic cheese, honey, jam, brandy, olive oil, wine, etc. in the surrounding villages. There are wine roads and summer fests in Pavlomir, vineyard situated 5 minutes from the villa. In Crikvenica and Novi Vinodolski you can enjoy Mediterranean food in fine restaurants or buy fish, meat, vegetables, fruit etc. at local market-place. Kvarner is just a few hours driving distance from Vienna, Munich... Distance from Crikvenica and Novi Vinodolski - 6km, from the County seat, the town of Rijeka - 25km, and only 160km from Zagreb - Croatian Metropola. The Rijeka-Krk Airport is just 20 km away and The Zagreb Airport Pleso is 160 km away. If you want to switch your reservation to another time period, we will do our best to accommodate you. At the time of confirmation of your reservation and payment of the first amount for accommodation, you expressly confirm that you are acquainted with the general terms and conditions, and that you are in acceptance thereof.